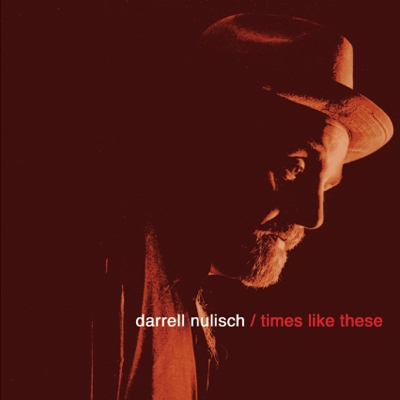 Poignant words expressed by one of today’s premier soul and blues vocalists, Darrell Nulisch on the title track of his CD, Times Like These. Times Like These is an exquisite offering from Nulisch who gives a dazzling performance in response to his 2000 W.C. Handy Award nominated I Like It That Way (Severn). Joining Darrell is his regular ensemble cast including long time collaborator/bassist Steve Gomes, guitarist Jon Moeller, drummer Robb Stupka and keyboardist Benjie Porecki. Several guests are featured including David Maxwell on piano and Steve Cyphers on percussion, plus a 6-piece horn section beautifully arranged and conducted by Willie Henderson of Tyrone Davis and Jackie Wilson fame. The basis for Darrell’s signature sound has always been his love and understanding of Southern soul. He captures that magnificently in his version of Junior Parker’s “I Found Love,” showcasing Darrell’s impeccable phrasing, evoking that classic Memphis feel. “This record shows my band’s willingness to ‘get out of the box,'” states Darrell, “to try more obscure things.” Offerings like their scorching remake of Little Milton’s “Lonely Man,” complete with Moeller’s fiery fretwork and resounding horns, and Gomes’ silky smooth “Handle It With Care,” leave plenty of chances to tap into a wealth of creativity. In typical Nulisch fashion, he offers up “Something Else,” a stripped-down Texas shuffle featuring David Maxwell at the keys and Darrell on harmonica, belts it out in true Otis style on Mr. Redding’s “That’s a Good Idea,” and closes the set with the joyful “Right Here at Home,”—the perfect ending to an inspired work of contemporary soul/blues. Check out Darrell’s entire Severn catalog: The Whole Truth; I Like It That Way; Goin’ Back to Dallas; and Just For You. All Songs Nulisch/Gomes Nugo/De Music Bmi Except Lonely Man M. Campbell, R. Lyons Conrad Music/Arc Music Corp. Bmi / Don’t Look Back W. Robinson, R. White Jobete Music Co., Inc. Ascap / Runnin’ Out N. Ashford, V. Simpson Wb Music Corp. O/B/O Earth Music, Inc./Tattersall Music Co. Bmi / Snow Is Falling R. Charles Arvee Music Company, Swing Beat Songs Bmi / That’s A Good Idea O. Redding Irving Music, Inc. (East Memphis) BMI / I Found Love, Copyright Control.